VEX IQ was designed with Education in mind. We have developed our own free 12 Unit modular curriculum that serves as a companion to the VEX IQ platform. Teach each lesson in order, or as its own individual lesson. 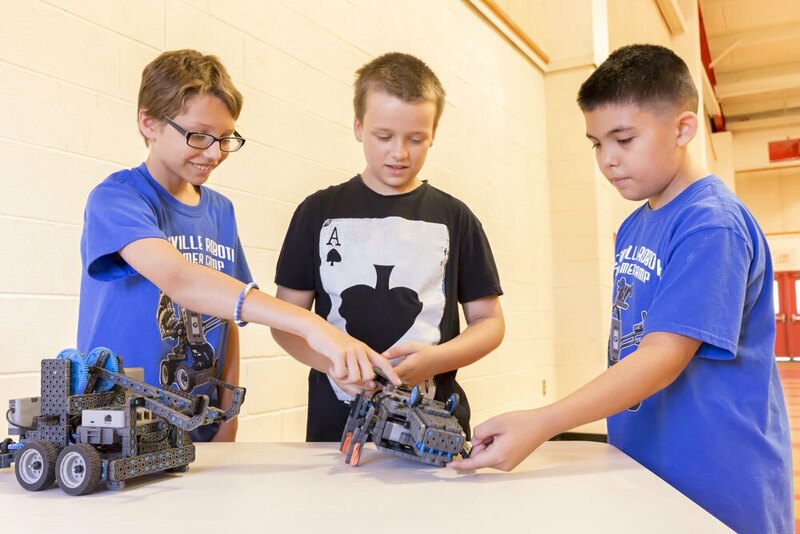 This curriculum can even be easily adapted to run VEX IQ Summer Camps! VEX has also partnered with Robomatter and PLTW, two world-class educational curriculum and solutions providers, to create research driven educational resources that easily implement high-quality STEM Robotics into classrooms. These company’s offerings include comprehensive technology and professional development products to ensure educators are prepared to succeed with implementation via these turn-key STEM educational tools. *Portions of Robomatter's products are manufactured under license from Carnegie Mellon University. ROBOTC and MODKIT programming software options are available with VEX kits and bundles at no extra charge! We have developed the VEX IQ Curriculum as a FREE companion to the VEX IQ platform for elementary and middle school students. The curriculum offers twelve flexible units of instruction that can be used in sequence, in chunks, or as standalone lessons. The VEX IQ Robotics Education Guide provides a solution for teachers searching for a standards matched STEM program as an all-in-one textbook. When paired with the VEX IQ platform it brings accessible, affordable, and powerful STEM lessons to life. The Teacher's Supplement provides a roadmap for educators and all of the necessary supporting materials, including a step-by-step means to confidently introduce STEM to students regardless of experience level. The Introduction to Programming VEX IQ includes videos, animations, and step-by-step lessons designed to help beginners learn behavior-based programming using the VEX IQ hardware and ROBOTC Graphical for VEX Robotics. The tutorials are designed to encourage independent learning and problem solving in pursuit of a goal. All are self-contained, require a minimum of instructor supervision, and include many built-in opportunities to self-assess progress. Prior robotics experience not required or assumed! The STEM CAD Workbook Bundle with SnapCAD is an excellent classroom resource that promotes theory, challenges, and activities in a 187-page printable feature-rich resource. The STEM CAD Workbook takes advantage of robotics as a way to teach math and engineering concepts and provides hours of in-class activity for students. It works as a stand-alone workbook or can be used to complement the Introduction to Programming VEX IQ video trainer.